Droll Yankees Seattle Rain Guard, Clear, 10" dia. Keep the seed in your existing Droll Yankees tube feeder protected from rain with the Droll Yankees Clear Seattle Rain Guard. Adding a dome to your existing, 2.5" diameter tube feeder helps direct rain away from the reservoir, keeping it dry and fresh for your feathered friends. The unique design of this guard slides over the actual feeder, rather than resting atop it. A hardy, included spring clamp keeps the dome secure at just the right spot on the reservoir, while its clear body ensures the avian activity remains visible. This guard is great for use with the Droll Yankees New Generation, Bottoms Up, and A-6 series of feeders (not included), and can also work on other tube feeders up to 2.5" in outer diameter. Its polycarbonate body is great for use for many seasons, and is also UV stabilized to resist wear from the sun's rays. 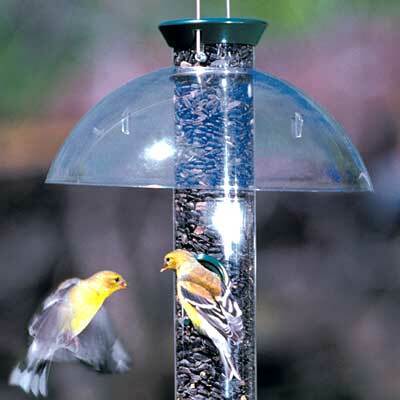 Protect the seed in your existing bird feeder from precipitation using this Clear Seattle Rain Guard. Made in the USA. Note: This description refers only to the Droll Yankees Seattle Rain Guard, Clear, 10" diameter. The feeder shown is not included. Woodlink Clear Plastic Weather Shield & Squirrel Baffle, 16"